Since 1971, Starbucks Coffee Company has been committed to ethically sourcing and roasting high-quality Arabica coffee. Today, with stores around the globe, the company is the premier roaster and retailer of specialty coffee in the world. Opened in March, 1975, Downtown Disney - originally the Lake Buena Vista Shopping Village - is an outdoor shopping, dining, and entertainment complex at the Walt Disney World Resort in Lake Buena Vista, Florida. 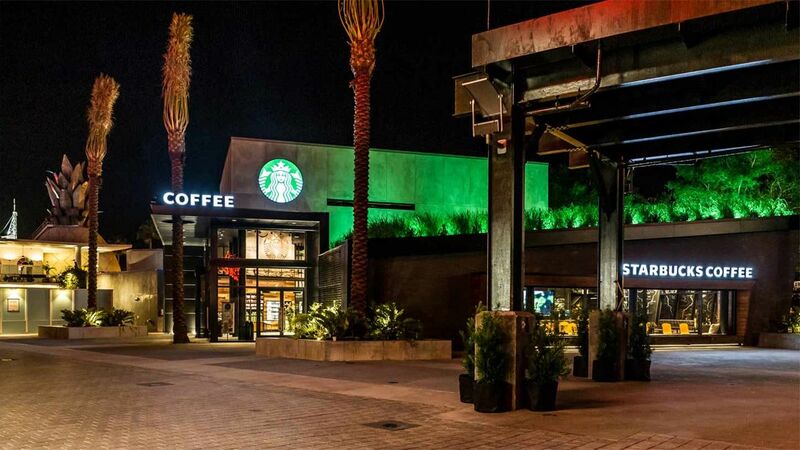 Starbucks opened a new LEED-certified store here in the Downtown Disney District in May, 2014. 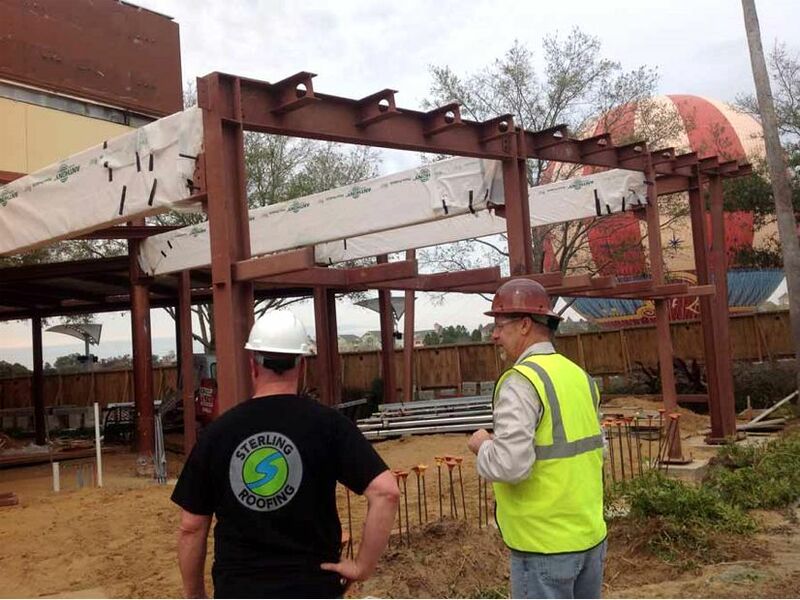 Over the next year, Starbucks and Disney will bring four more Starbucks locations to guests. 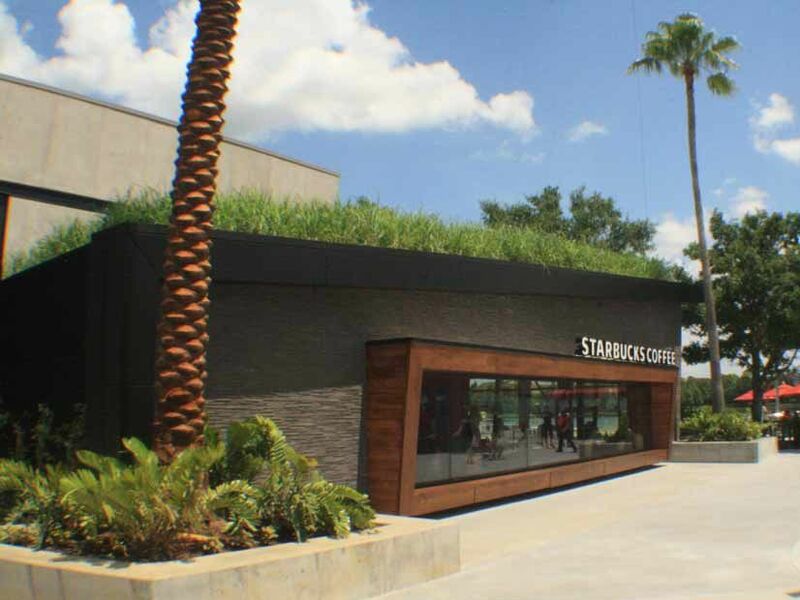 Senior Designer for Starbucks, David Daniels vision of a green roof atop the new Starbucks store has grown from an idea and conceptual poster on the construction walls in Downtown Disney West Side, Orlando to a thriving, tropical lemongrass sustainable ecosystem. According to the Starbucks Newsroom, the new 4,000 square foot Starbucks store is a new page in the collaboration between two iconic brands. 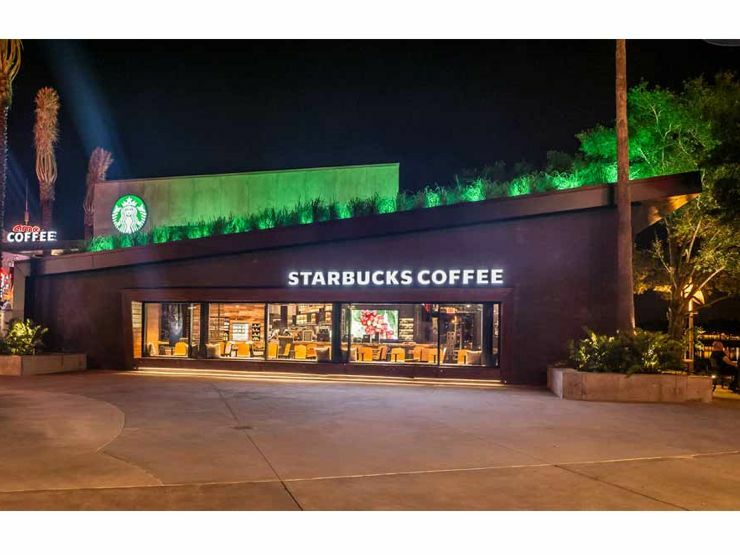 In March of this year, Starbucks and Disney teamed up to open the first company-operated Starbucks location at Downtown Disney in Anaheim, California. See its Living Wall profile in the Greenroof & Greenwall Projects Database. 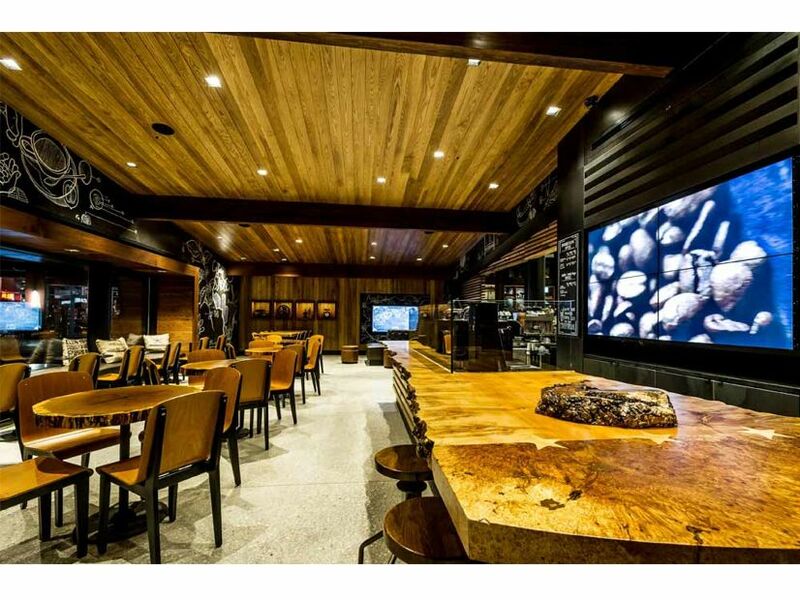 The stores integrate local relevancy and sustainability into store design and contain 70-inch digital display panels with built-in cameras, a moss Starbucks siren sculpture by Paloma Teppa, reclaimed wood and LED store and green roof lighting. 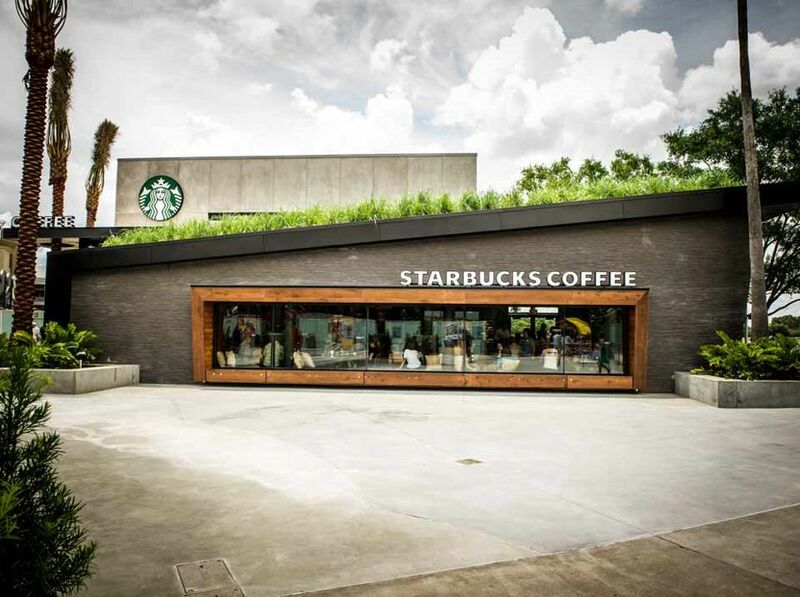 The 1,800 square foot Starbucks Disney Orlando green roof is planted with lemongrass, Cymbopogon citratus. Cradle to cradle sustainability is woven throughout the green roof system and plantings. Coffee grounds are saved from daily store operations, recycled through composting and used to feed the green roof plants. The green roof plants attenuate and filter storm water runoff, helping to protect the adjacent Lake Buena Vista water bodies. Birds, dragonflies and butterflies have already adopted the lemongrass savannah-like ecosystem for communal and foraging habitat. 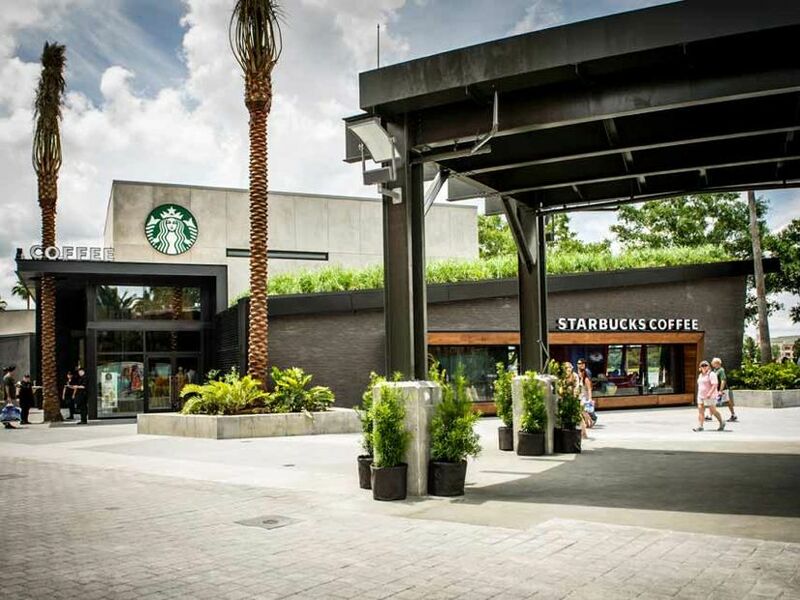 The green roof plants mitigate the ever-present Florida urban heat island effect and green house gases, sequester carbon and provide fresh oxygen for Downtown Disney Main Street visitors. 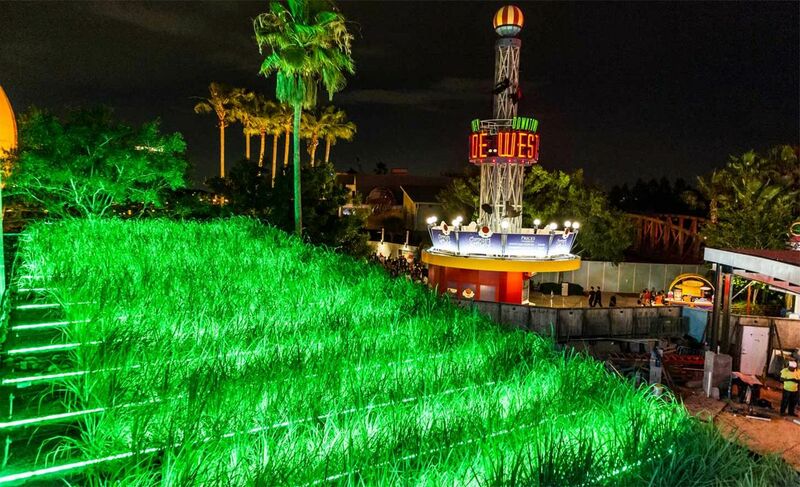 Energy efficient LED lighting is not only used throughout the Starbucks store but also accentuates the green roof lemongrass during Disney Main Street lively nights. Installation of green roof plantings and hurricane wind-uplift resilient system was completed through coordinated efforts between the Starbucks design and construction team, Disney Imagineering, the general contractor Elfrink Construction, roofing and green roof contractor Sterling Roofing, and MetroVerde tropical green roof design group. We are excited we can provide such an incredible roof for Starbucks, says Jimmy Sterling, President of Sterling Roofing, This green roof provides so many ecological benefits. Soil media for the green roof was developed through the University of Central Florida Stormwater Management Academy, by Dr. Marty Wanielista and Mike Hardin. The lightweight green roof soil media is designed to promote the cleaning of stormwater as well as supporting optimal plant growth on the harsh conditions of Florida rooftops where temperatures and humidity reach levels difficult for most plants to grow in. Sterling Roofing coordinated installation of the green roof soil media via supersacks and lift truck. Starbuck green roof lemongrass is irrigated with a micro-drip system during summer droughts. The MetroVerde green roof system is designed for resiliency to tropical storms and hurricanes and has been tested with the University of Florida Civil Engineering Department outdoor hurricane turbine simulator 130 mile per hour wind velocities. Considering Florida unique and harsh biophysical design variables, MetroVerde models multiple climate, physical and ecosystem factors when designing or specifying a tropical or coastal green roof system and plantings.